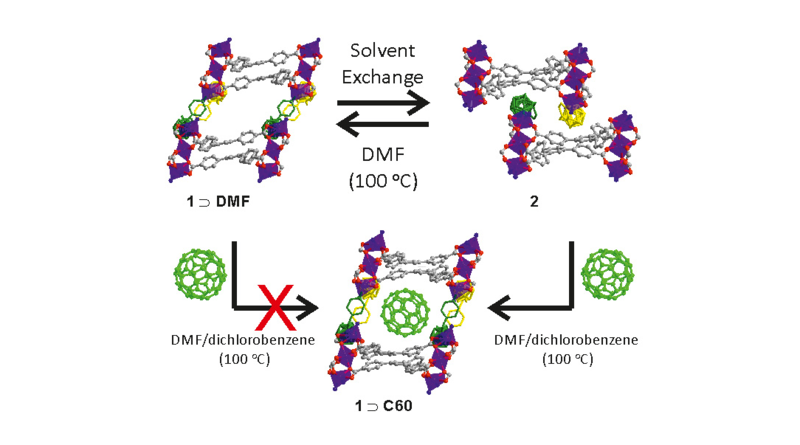 The flexibility and unexpected dynamic behavior of a third‐generation metal–organic framework are described for the first time. The synthetic strategy is based on the flexibility and spherical shape of dipyridyl‐based carborane linkers that act as pillars between rigid Co/BTB (BTB: 1,3,5‐benzenetricarboxylate) layers, providing a 3D porous structure (1). A phase transition of the solid can be induced to generate a new, nonporous 2D structure (2) without any loss of the carborane linkers. The structural transformation is visualized by snapshots of the multistep single‐crystal‐to‐single‐crystal transformation by single‐crystal and powder X‐ray diffraction. Poor hydrogen bond acceptors such as MeOH, CHCl3 or supercritical CO2 induce such a 3D to 2D transformation. Remarkably, the transformation is reversible and the 2D phase 2 is further converted back into 1 by heating in dimethylformamide. The energy requirements involved in such processes are investigated using periodic density functional theory calculations. As a proof of concept for potential applications, encapsulation of C60 is achieved by trapping this molecule during the reversible 2D to 3D phase transition, whereas no adsorption is observed by straight solvent diffusion into the pores of the 3D phase.